Bassnectar | SPRING TOUR 2013!!! 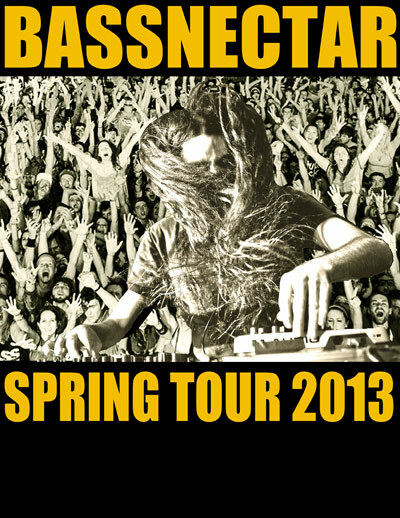 ANNOUNCING: 3 Weeks Only – Bassnectar Spring Tour 2013 Dates! After a year of slammed arena shows, we wanted to put together a special run of dates in tighter, more intimate venues; some of which we have outgrown, and some of which we’ve never played before. We will be bringing our full set-up out and customizing each room into the perfect setting for maximum explosion, and we have hand-picked each venue for its ideal atmosphere. It kicks off mid-April: 3 weeks of nonstop mayhem starting right out of Coachella and making our way down the East Coast towards Atlanta. Our special guests GRiZ, Michal Menert, and Thriftworks are all along for the ride. Discounted presale tickets will be available on Wednesday, February 6th @ Noon EST, with the public on sale beginning Friday & Saturday depending on the venue. Scroll down or hit www.bassnectar.net/tour for all of the info. 1. We expect these dates to sell out fast, and with limited capacity scalping is always an issue. If you want to be a part of this adventure, we suggest you buy presales and avoid an upset. We will do our best to get as many true bass heads and wonderful people packed into each room as we can, so please coordinate with your friends to avoid paying high scalping prices later, as with smaller venues this problem gets more intense. 2. There are so many wicked towns, cities and villages we love traveling to, but of course we cannot be everywhere at once. The idea for 2013 was to play a bunch of rad festivals, ramping up to a Fall Tour stampede. We put together this shorter blast of more intimate dates with only three weeks to work in, so there was just a limited number of places we can reach. If you don’t see your city on our map, there is a good chance we will be seeing you this Fall. Also, we have certain large festivals scheduled which affect where we can or can’t play this Spring. We can’t go everywhere, every season, but it goes without saying that we have so much love for our friends all across the country, and without your passion and support none of this would be possible – so we thank you from the bottom of our hearts. 3. We are happy to announce that we’ve had all venues agree to allow one sealed water bottle in with each patron. This has been a huge undertaking, something we’ve never before been able to do. Please be extremely respectful with this. Enjoy the healthy goodness of water, but please don’t throw it!